In 1897 Hermon Lee Ensign, a wealthy journalist, founded the National Humane Alliance as a way to 'spread about humanitarian efforts among people.' When Ensign died in 1899, a large portion of his estate went to the Humaine Alliance for the creation of animal drinking fountains. Between 1906 and 1911 Bodwell Granite Co. cut and polished the pieces for about 125 fountains - the large bowl had a diameter of 6 ft and a total weight of 5 tons. Any town could apply to the National Humane Alliance and would receive consideration based upon three conditions. One: The fountain site is acceptable to the National Humane Alliance. Two: The site must be in a high traffic area and where it can be approached from all sides. Three: The city must put it on a good foundation, guarantee ample and continuous water supply, and proper permanent care. Click here for images of our fountain restoration project. 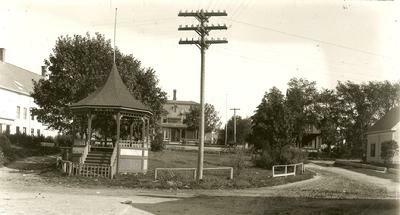 There isn't much known about the W-14 club, but we do know that in 1895 they built the bandstand so the popular Town Band could perform some open-air concerts during the summer. 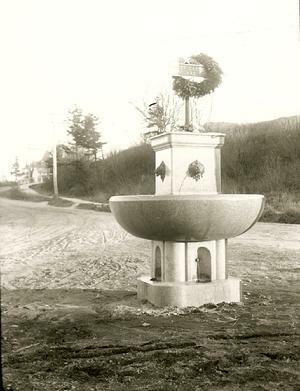 Originally it was placed at the corner of Water St. and Main St. (where the Moses Webster Fountain stands now), but a few years later it was moved up the hill to it's current location. Click here for more information on the Band Stand project. A remarkable piece of Bodwell Granite Company's equipment for moving large blocks of granite. The galamander was equipped with a derrick, to which was attacted a rope tackle, which lifted the large piece of stone from the ground and underslung it between the rear wheels, and then pulled by teams of horses. The glamanders that were familiar and common on Vinalhaven were painted a shade of blue knows as "Elder Littlefield Blue." The largest was known as 'Jumbo' and was drawn by an eight horse hitch. 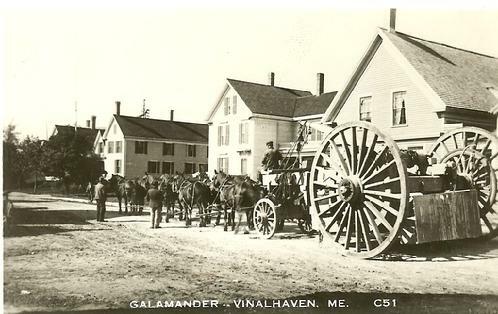 The galamander sat until 1965, when the town appointed a committee to investigate the repairs needed. It was found that the Galamander was in too bad a shape to be repaired, so the plan was changed to rebuild using as many old parts as were till serviceable. Raising money and finding someone to do the work were a problem. Earle Bryant in Dresden, ME, undertook the job and the galamander was disassembled and transported to his home. Using peices as patterns and guided by photographs, Bryant tried to salvage as much as possible from the original galamander. Once again the galamander is in need of desperate repairs. It is covered by a newly shingled roof, but the sides are still open to the elements and time and weather have taken it's toll on it. Click here for more information on our galamander project.